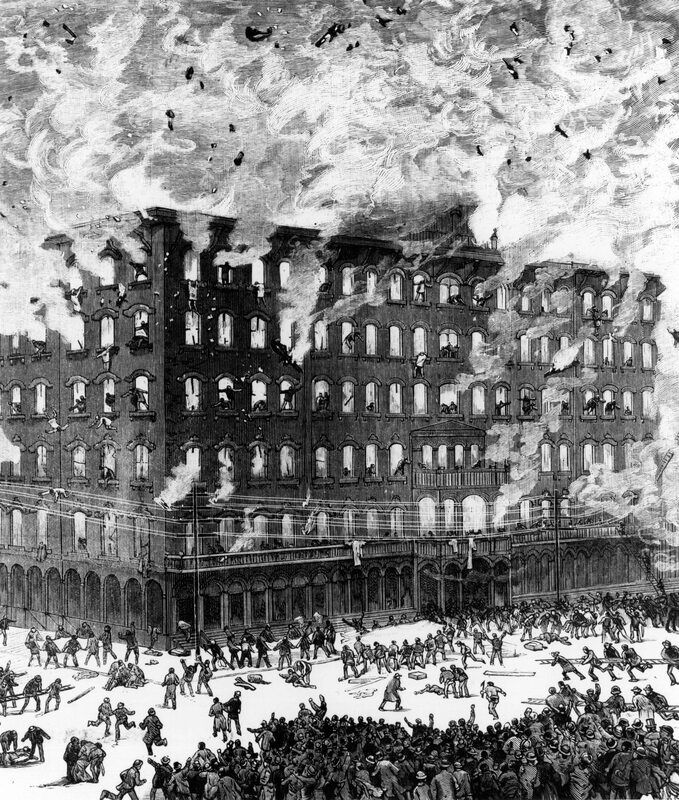 The deadliest fire in Milwaukee history occurred at the Newhall House hotel on January 10, 1883 on the corner of Michigan Street and Broadway. Firemen who battled previous fires at the hotel, one of Wisconsin’s largest, dubbed it a “tinder-box.” The inferno originated in the opulent structure’s wooden elevator shaft and took over twenty-six hours to extinguish. Seventy-two people died, many jumping from their rooms. After raising and extending a ladder across an adjacent building, firefighter Herman Strauss heroically rescued ten female servants. A song composed by J. W. Kelley, “The Milwaukee Fire, or the Burning of the Newhall House,” memorialized the blaze, and monuments at Forest Home and Calvary Cemeteries commemorate the victims. ^ This entry was originally posted to the Encyclopedia of Milwaukee website on April 6, 2016. The bibliography was revised on March 15, 2019. ^ “Fortieth Anniversary of the Newhall House Horror,” The Milwaukee Journal, January 7, 1923; Joseph J. Korom Jr., Look Up Milwaukee: Eastside/Westside All Around Downtown: A Descriptive and Pictorial Display of Selected Architectural Scenery (Milwaukee: Franklin Publishers, 1979), 143. ^ “Century’s Deadliest Fire,” The Milwaukee Sentinel, October 1, 1987; “Newhall House Fire 40 Years Ago Wednesday,” The Milwaukee Sentinel, January 10, 1923. ^ See Carl Baehr’s “Newhall House Fire Victim Count,” below. ^ “Tragic Newhall House Fire to Be Remembered at 49th ‘Memory Mass’ Wednesday,” The Milwaukee Sentinel, January 11, 1932. ^ “Milwaukee fire, The; or, The Burning of the Newhall House,” Notated Music, Library of Congress, http://www.loc.gov/item/sm1884.03567, last accessed April 6, 2016; Old Days at Slensby’s Variety Theater,” The Milwaukee Journal, April 27, 1927. ^ “Newhall House Fire 40 Years Ago Wednesday,” The Milwaukee Sentinel, January 10, 1923. Korom Jr., Joseph J. Look Up Milwaukee: Eastside/Westside All Around Downtown: A Descriptive and Pictorial Display of Selected Architectural Scenery. Milwaukee: Franklin Publishers, 1979. “Newhall House before Fire Tragedy.” Milwaukee Scrapbook, 1870-1920. Milwaukee Small Collection 52. University of Wisconsin-Milwaukee Libraries, Archives Department. Prigge, Matthew J. Damn the Old Tinderbox! : Milwaukee’s Palace of the West and the Fire that Defined an Era. Madison, WI: Wisconsin Historical Society Press, 2019. When disasters occur, counting the number of victims is a difficult task. First responders focus on rescuing the living; news media rush to disseminate information quickly. Sometimes only meticulous later research can establish precisely how many people were killed and injured. Accounts of the Newhall House Fire routinely mention 71 victims, but my review of the evidence suggests that the total was actually 72. The Newhall House fire occurred on 10 January 1883, and before the end of the month newspaperman Julius Bleyer had published an account of the fire. Regarding the number of victims, he wrote, “Coroner Kuepper took official cognizance of twenty-eight identified bodies and forty-three that could not be identified, a total of seventy-one.” Bleyer lists the names of the 28 identified bodies, but he neglected to list Catherine Monaghan (or Monahan) as an identified victim. The addition of Monaghan brings the total of identified bodies to 29, but leaves unchanged the 43 unidentified, resulting in a total number of victims of 72. There were a number of reports that Monaghan, who jumped from an upper floor to escape burning, was among the victims. One report was that undertaker “S.F. Peacock conducted the funerals of Mary Conroy and Catherine Monaghan, both to Calvary Cemetery.” Mary Conroy is on Bleyer’s list of identified victims, but Monaghan is not. Other sources tell us that Kate Monaghan worked in the laundry at the Newhall House and that she was born about 1840 in Galway, Ireland. There may have been one more victim. Ben Tice, the chief clerk of the Newhall House, stated that there were 177 people in the building when the fire started, 110 guests and 67 employees. With seventy-two dead and 104 saved, 176 are accounted for, leaving one person whose fate is unknown. ^ Julius Bleyer, Burning of the Newhall House (Milwaukee: Bleyer Bros., 1883). ^ Bleyer, Burning of the Newhall House, 41. ^ “Day of Horror Five Bodies Brought to Light—Work of the Undertakers.” Milwaukee Sentinel, (Milwaukee, WI), January 13, 1883. ^ Bleyer, Burning of the Newhall House, 40. ^ “The Newhall Plans of Each Floor…” Milwaukee Sentinel, (Milwaukee, WI), January 20, 1883, 2; Wisconsin. Milwaukee County. Court of Probate. Probate Records. Case Number 5359. ^ “The Evidence…” Milwaukee Sentinel, (Milwaukee, WI), January 19, 1883, pg. 3. ^ Carl Baehr, From the Emerald Isle to the Cream City: A History of the Irish in Milwaukee (Milwaukee: Everything Goes Media, 2018).